An update on my Daisy Chain Quilt today as was promised when eight out of the twelve rows were joined together. It has been just over a month since my last Daisy Chain Quilt progress report and during that four week period I did not touch this project for the first two weeks. I began to worry that I had lost my momentum with this project and had to push myself to pick it up again. Of course from the moment I threaded the needle again I haven't looked back. 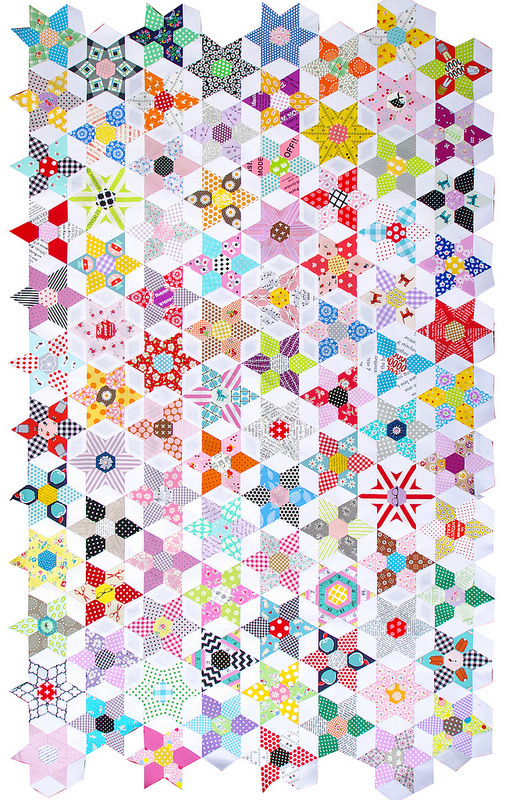 Eight out of the twelve vertical rows of Daisy Chain units are now joined together and I am happy to say it is starting to look like a quilt top. 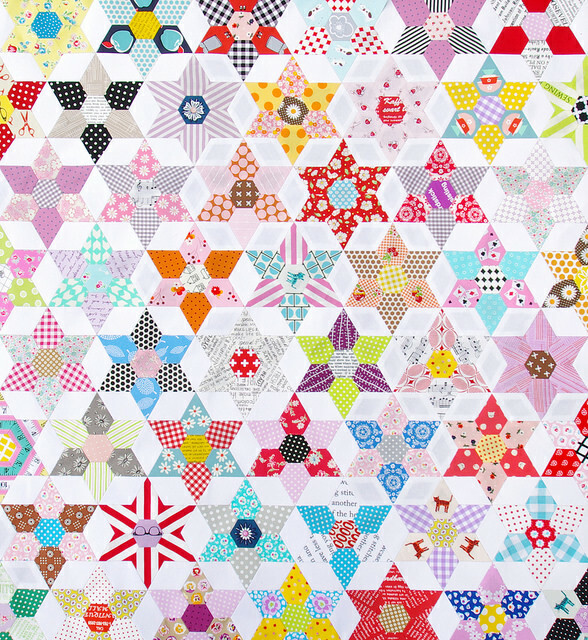 As the quilt top grows it is becoming increasing more difficult to handle and it is definitely not a pretty lap project. Nor it is portable! It takes up the whole couch with me buried under it. 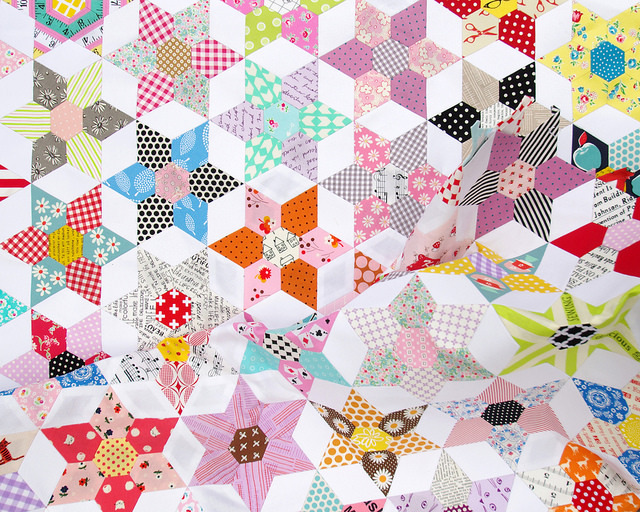 Mind you, I have sewn the quilt top together in sections: two rows at a time, that were then sewn together to become four rows, then the two sets of four rows were sewn together. So the discomfort of having to handle a large section of the quilt top with papers still in is short lived. Most of the papers are still in although you may be able to tell from the photos that I have taken a few papers out (where you can see the seam allowances) because I can't wait to see what the quilt top will look/feel like without them. I have glue basted my papers for this project and I am happy to report that very few papers popped out unexpectedly whilst working on the project - I have had to glue baste two or three papers back in as they were near the edge that I was working on. 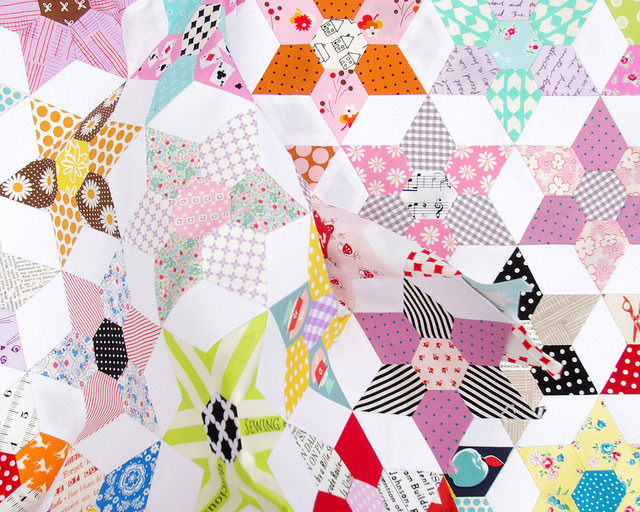 Other than that all papers have reliably stayed in place despite all the handling and manipulation of the quilt top. Below is a photo of what my project looks like right now (eight vertical rows). The piece measures approximately 42 inches x 75 inches. As you can see, even when all of the twelve rows are joined together I will still have quite some work to do to fill the gaps along the edges. I have also come to realize that just because you spend a lot of time carefully arranging all units on a design wall, place those units in order into separate snap lock bags - one bag for each row - and number the bags, it does not mean that you will join the units for each row in the set order, nor join rows in sequential order. How does that even happen?! 2" Diamond pieces for joining Daisy Chain units together. Robert Kaufman Kona Cotton in White for the connecting diamond shape. 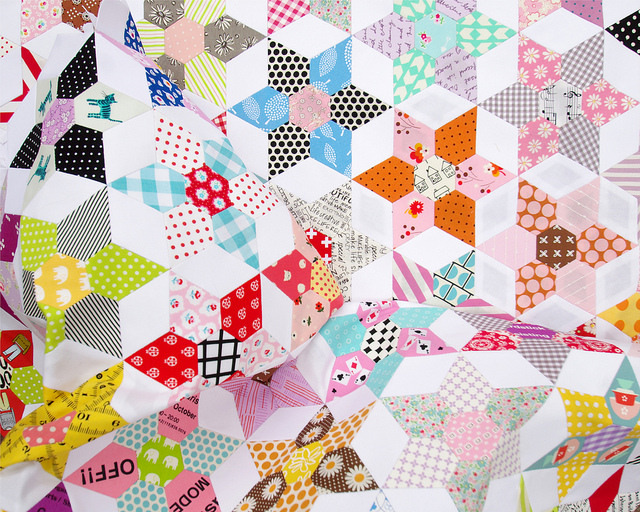 The next Daisy Chain Quilt update: when all twelve rows are joined together. 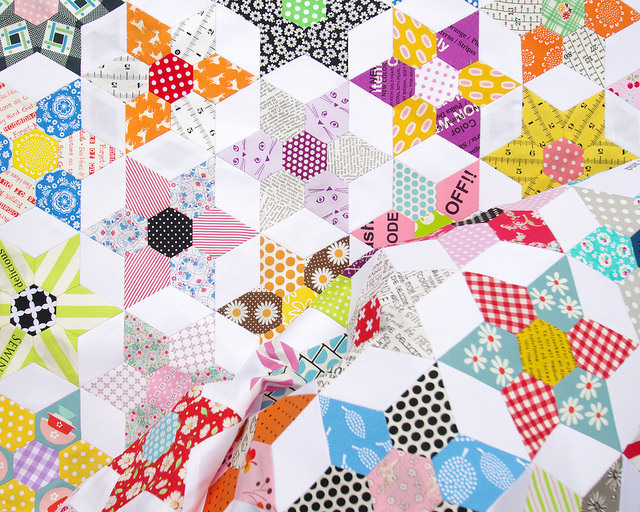 I know I always say the quilt you are currently working on is my absolute favorite, but I really mean it!! Matching all those points perfectly amazes me! Gorgeous! Thank you very much. My OCD daughter and I arranged 100 blocks in a particular this-a-way and that-a-way with no similar colors together. We took photos and checked for errors. We did the rows first block on top with a safety pin in the upper left hand corner. It should have been perfect. But nooooooo. It was like a crazy person tossed them up in the air and sewed them together cross eyed. I cussed and did a little stomping. They are frogging much slower. This, my dear, is magical. I want to read every block. Congratulations. Rita your work is visually stunning always but this takes the proverbial cake! May I ask you a question please?? 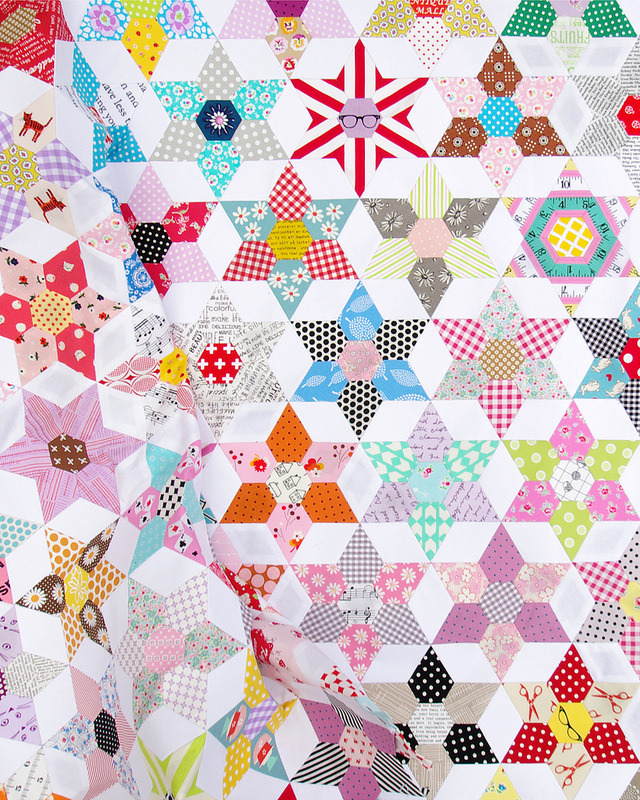 Is the entire quilt sewn by hand? The daisy sections put together by hand also before you connect them? I'm new to EPP but fascinated!! Thank you. Simply beautiful, as usual. Your work is so inspiring. 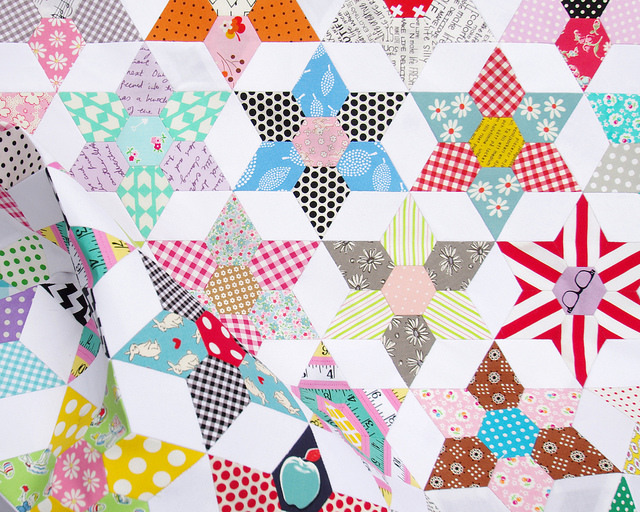 Will you keep this quilt? This is beautiful and reflects your inimitable style! I'm enjoying seeing this grow! Apparently you never you stop! For our pleasure :) Tank you Rita! Stunning as always Rita! I'm convinced there's nothing to be done about blocks rearranging themselves. 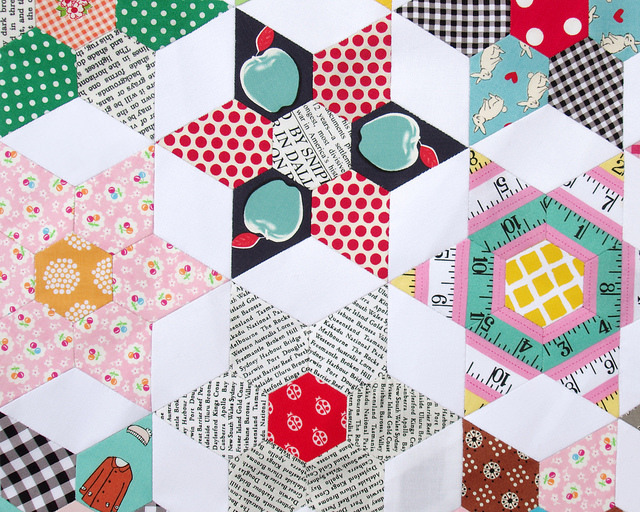 I occasionally use the webbing method to put my quilts together and I've even had it happen then. The thing is, No one but you knows which are the rogue blocks! 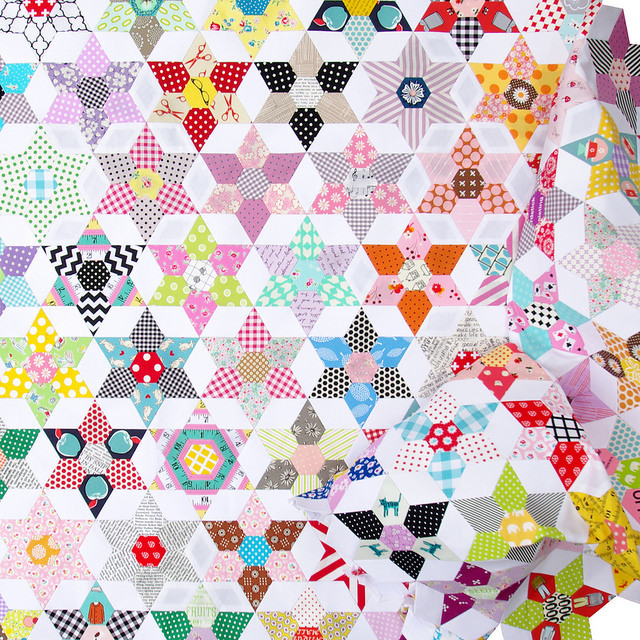 Your quilts make me feel happy! Thanks for the joy! Wow! what an amazing project! Love your detail of placing the prints. 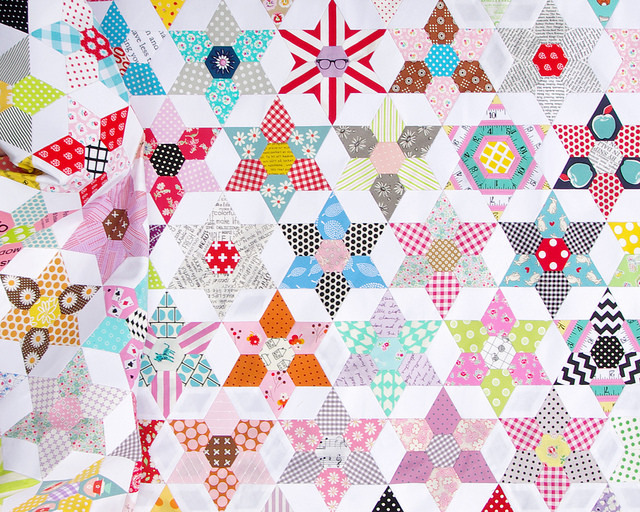 Love it--so fun and cheerful! Sweet Rita. I agree, these flowers are so cute, and happy. I love the arrangement. Thanks always for sharing your path of progress. This gives others incentive to get back to half finished things. This is really cute! How I wish I was able to do something like that! 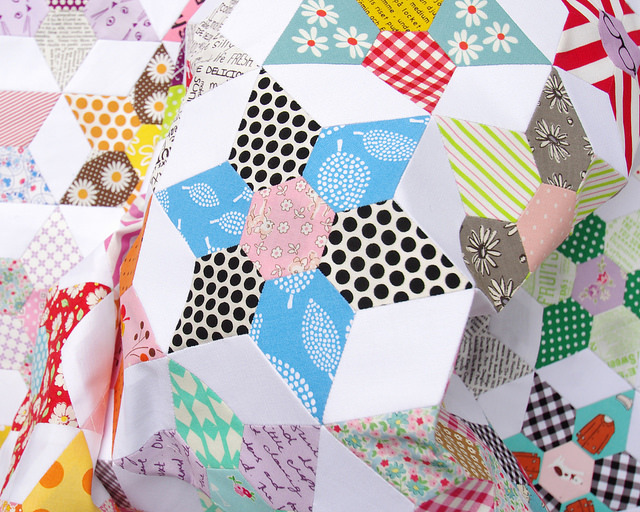 Would you mind sharing where you purchased the paper piece patterns? Thank you for your kind and quick response! 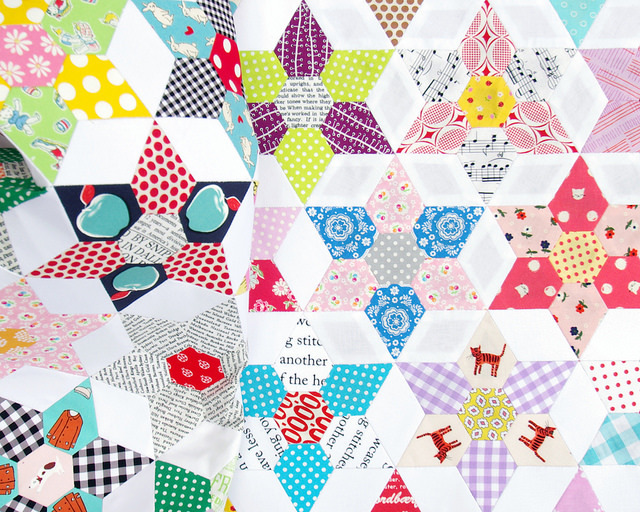 I purchased the papers here: http://www.sewandquilt.co.uk/product-category/english-paper-pieces/pentagons/ (these links are included in the blog post also). There is no pattern as such, there are no instructions.